What reveals more about an author, fiction or non-fiction? Throughout his life, Churchill published hundreds of speeches and over fifty books, including an autobiography, a novel, a biography of his father, and personal accounts of both world wars. Clearly, he had no qualms about telling his story to the public. With that in mind, it seems odd that the one piece of writing he hesitated to publish was a fictional short story, The Dream. Despite being fictitious, The Dream contains very real characters: Churchill and his father, Lord Randolph. Churchill wrote the first draft in 1947, but it was not published during his lifetime. Considering how ready he was to publish most everything he wrote, one cannot help but wonder if there was something more personal about The Dream than anything else he had written. It does not take much research into Churchill’s life to discover that his relationship with his father was flawed and complex. 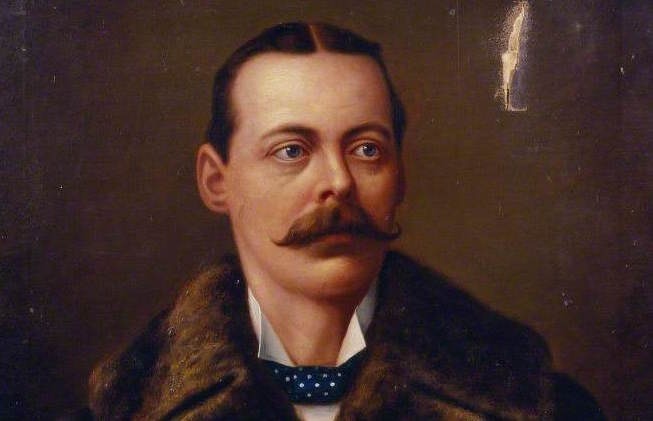 Lord Randolph died in 1895, when Winston was twenty. In the years preceding, the son faced frequent and even public criticism from his father, some of which he recounted in his 1930 autobiography, My Early Life. The Dream revisits the relationship from the perspective of an older, more experienced Winston. The result is poignant, nuanced, and ironic, and allows the reader a unique glimpse into Winston’s complicated view of his father. The piece opens with Churchill copying a portrait of Lord Randolph in his studio at Chartwell. The scrutiny and focus required in portrait painting serves as a fit opening to this essay, which is itself a scrutiny of Lord Randolph. As Churchill works on the portrait, he glances up and sees his father seated in a nearby chair, looking “just as I had seen him in his prime.” In most “ghost” stories, the ghosts usually take the broad view of time, as opposed to the living, whom they visit. Churchill reverses that trope: it is his father who has been plucked from time, frozen at the height of his powers. It is Churchill who looks back and surveys all that has happened since his father’s death. This passage, so redolent of Churchill, serves as a kind of quiet reproach to Lord Randolph’s skewed assumption that Winston’s generation had experienced “a Golden Age.” It hints at all Winston Churchill has faced—and what is more, overcome—over the many decades: events which might have seemed unthinkable to the generation that came before. But The Dream is not simply a reproach to Lord Randolph and an affirmation of his son. Our author’s intent is more complex. Rather than say what he has accomplished, Churchill conceals his achievements from his father. Even his beloved Chartwell remains obscured, hidden from sight by the fog. Instead, he allows Lord Randolph to criticize him. These are simultaneously the sharpest and the kindest words Randolph delivers throughout the story. The Dream allows the father to say what the son would certainly have wanted to hear—“I loved you dearly.”—but conceals it amidst his father’s criticism. The passage acknowledges the disappointment and indifference Winston felt from his father, coupled with his hope and belief that, beneath it all, Randolph held a kinder opinion. Alas, Lord Randolph is not permitted to hear or praise his son’s accomplishments. Throughout the piece, Churchill builds the expectation that he will tell his father everything—but the big reveal never comes. Instead, our author uses irony to meditate on the triumphs and disappointments of his life. Winston never tells his father the story of himself as heroic statesman; he tells him the story of himself as Winston. To reveal his accomplishments would destroy the work’s power. Is this a criticism? A fatherly affirmation? A suggestion of the pride Lord Randolph certainly would have felt, had he lived long enough to witness his son’s finest hours? In a way they function as all three, acknowledging the complexities of the father-son relationship, while giving the reader the fullest picture of what Winston Leonard Spencer Churchill really felt. But mention of “the reader” brings up a final point: why did Churchill express all this in a private article? There was nothing Winston could do to remedy that. Instead, he uses this piece of haunting fiction to meet his father half way—between the Winston Lord Randolph had known, and the Churchill who was now known throughout the world. Katie Davenport is a Churchill Fellow at Hillsdale College, and part of the team producing The Churchill Documents. She is in her senior year, majoring in Art and English.